In-Lock is a locking point for any Mountain Bike or Motorbike while at an outdoor event or camping. In-Lock's main aim is to deter any opportunist thief. In-Lock works by having the pin screw into soft ground and it then cannot be pulled out. The hole in the main body of In-Lock allows a lock or chain of any shape or design to be used to secure a Mountain Bike or Motorbike of any make or model. 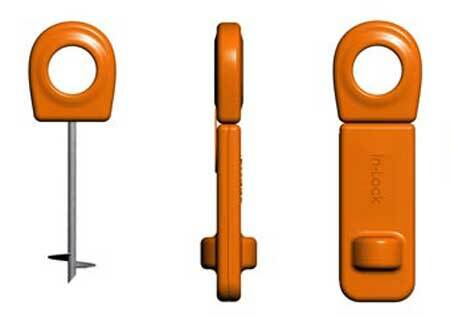 In lock is essentially a NI-CR-MO pin which runs right through an impact modified Polypropylene main body. The NI-CR-MO pin is the same material used on locks and chains currently used within many security products currently on the market. The polypropylene body alerts people that the Mountain bike or Motorbike is secured by the use of bright colour and provides extra protection to the pin. Although this is just a design thesis, the idea is great, especially for use with lighter motorcycles like the R5 or RD, or dirtbikes. Sometimes there's just nothing to secure the bike, or you don't have a chain long enough to go around that pole or tree. This little device is ingenious and I hope to see it make it to production.